Through-hole assembly refers to the mounting scheme used for electronic components that involves the use of leads on the components that are inserted into holes drilled in printed circuit boards and soldered to pads on the opposite side either. This is done by either manual assembly or by the use of a wave-soldering machine. From the second generation of computers in the 1950s until surface-mount technology became popular in the late 1980s, every component on a typical circuit board was a through-hole component. Through-hole mounting indicates stronger mechanical bonding and applicable for products that are ready to suffer from mechanical stress. Through-hole assembly also is easily adjusted by hand or completely replaced. This is why engineers prefer to use it for prototyping. Because through-hole component leads go through holes on boards, it is time-consuming and can lead to higher cost. Through-hole mounting also limits routing space of multilayer printed circuit boards because drilled holes have to cover all layers of the board. Design engineers often prefer the larger through-hole rather than surface mount parts when prototyping, because they can be easily used with breadboard sockets. When it comes to soldering of through-hole mounting, wave soldering or hand soldering is relied on so that both reliability and repeatability will be challenged with manufacturing efficiency reduced as well. What is Surface Mount Technology? Surface-mount technology (SMT) is a newer method for producing electronic circuits in which the components are mounted or placed directly onto the surface of printed circuit boards (PCBs). An electronic device so made is called a surface-mount device (SMD). SMT is more accessible to smaller PCB sizes, higher-density components and more board surface area saving. SMT provides lower cost and shorter manufacturing time because it doesn’t require drilled holes. But, this also make components more to mechanical stress. 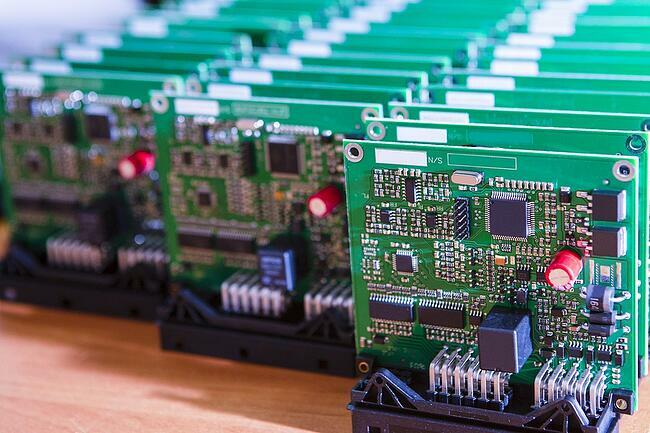 That means SMT assembly can produce less reliable PCBs. So, while surface mount assembly might speed up the production process, you run a higher risk of defects. In addition, SMT required a big financial disadvantage as the capital investment involved in its machinery and production is higher. So, although SMT has made possible applications that once seemed impossible with through hole, there are drawbacks. It should also be pointed out that both technologies can be used on the same board, with the through-hole technology used for components not suitable for surface mounting such as large transformers and heat-synced power semiconductors. Also, while surface mounted assembly provides many modern advantages, most legacy systems have boards that were assembled using the through hole method. If you are up in the air regarding which assembly to use for your project, contact the Levison Enterprises team. Levison specializes in through-hole technology. Our experts can provide the information you need to make a better-informed choice, and our in-house engineers can provide recommendations on your design to make production faster and more efficient. Levison Enterprises has quality control measures in place to ensure our clients receive 100% satisfaction, 100% of the time.